Taj Begum, a consort of Emperor Akbar was highly devoted to Shrinathji and so the Lord himself often used to visit her house during the nights when shri Thakhurji is resting after the sayan Darshan to play Shatranj (Chess) with her. On one fine day when Sri Vithalnathji opened the doors of the shrine to awake Shri Thakurji and he noticed the Lord is having a deep sleep. Thakurji then informed that he had played Shatranj with Taj Begum until late at night. Further more he had worn suthan and pataka a Muslim dress which was never created for him by Sri Vithalnathji. So he asked what is this? Where did you get the dress? 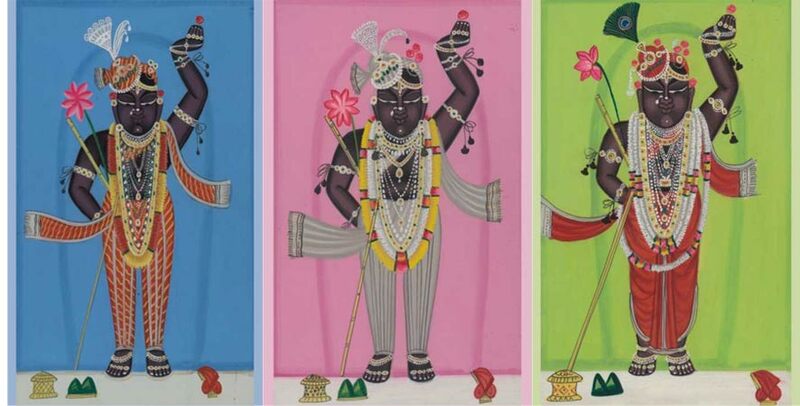 Shrinathji replied “This is presented to me by Taj Bibi”. After some years Taj Begum during her last days of life requested Akbar to take her to Shrinathji on Holi. There she noticed Thakurji with Gulal powder where the poets were singing verses composed by Taj Begum. She then rushed towards him, leaving her earthly body at Lord’s Shrine. Emperor Akbar heard the news of her death, and he then remarked that “Taj who had journeyed far from her abode has returned there from where she belonged. Shrinathji International lighting consultant was formed in the year 1995 by Subhash Kapadia who is the President of this company. We are the first & only publisher of a book which has broken the records of all pushtimarg publications.